How is your time best spent? Trying to cut expenses by a dollar per cow or a penny per hundredweight? For every hundred cows you milk, you will save $100 for every dollar you cut in production costs per cow. If each of those cows are putting 24,000 lbs. of milk in the tank each year, finding one cent per cwt in savings will save $240 per year. A penny per cwt. trumps a dollar per cow in 2016. Sound familiar? That was the closing paragraph from last month’s column, and a good starting point today. Since March, we have not seen any good news in the milk markets. Belt tightening must continue which is particularly worrisome as the time to plant crops rapidly approaches. As mentioned last month, it is really, really important to look at the long-term, as well as the short term, implications of costs that are cut now on future productivity and potential profitability. Take care not to make knee-jerk cuts in feed costs. As the single biggest cost, it is an easy target, and should not be overlooked. That said, losing pounds of milk, components, and/or condition can exact a toll down the line. The Ohio Farm Business Analysis Dairy Summary shows time and again that at any particular feed cost per cwt, there will be farms making money and farms losing money. But a look at the data for the last 4 years clearly shows that the farms that achieve the highest net return per cow consistently sell more milk per cow than the rest of the farms. An average of more than a ton per cow per year more over the last 4 years. More milk to spread the feed costs over results in an average feed cost of $1.32 per cwt less for the high 20%. Table 1. Ohio Farm Business Analysis and Benchmarking data for 2011 through 2014. High 20% based on net return per cow. While you are working with your nutritionist to be sure there are not ingredients in your ration that have outlasted their usefulness, make sure your components are in line. The class III price is based on 3.5% fat and 2.99% protein. We are in a component – based market in Federal Order 33, so if your components are below these levels, your base milk price will be even lower than the currently pitiful Class III prices. This is an issue that is becoming all too real for many farms. There are many important decisions to be made as costs must be cut. Tap in to the Dairy Issue Briefs at http://dairy.osu.edu to help identify opportunities to control costs and concerns to consider. The Dairy Issue Briefs were originally developed to help dairy farm families deal with the challenges of 2009’s low milk prices. Time to pull them out again. For the country’s dairy farmers, there doesn’t appear to be anything “sweet” to anticipate in ‘16. On the contrary, slimming down production costs is essential. With a 4-year average total cost of production of $19.66 – which is already adjusted for bull calf and cull cow income –there is a yawning chasm between production costs and milk income per cwt. Where to start slimming? First, let’s determine “what is”. What are the big players in the list of costs? Table 1. Top 10 production costs, 2013 and 2014 Ohio Farm Business Analysis Program, average of all farms. No surprise to any dairy farmer, feed costs are the single highest cost on all farms. These feed costs are for all animals; milking and dry cows, replacement heifers and calves. All homegrown feed is valued at total cost of production. The top 4 costs were the same in both years: feed, labor, depreciation and supplies. Supplies and vet & meds switched places, and there were minor changes in the bottom four expenses, all 2.4% of total expenses or less. These numbers represent the average for all farms. There is a substantial range in herd sizes in these farms. Does herd size make a difference? In 2013, the top 4 expenses, accounting for 77% of total costs, were the same across all herd sizes. Feed, labor, depreciation, and supplies. Herd size was broken down into 51 to 100 cows, 101 to 200 cows, 201 to 500 cows, and over 500 cows categories. The only thing that changed between herd sizes was in the 201 to 500 cow category where supplies were number 3 and depreciation was the 4th highest cost. What is the take home? For most herds, the 4 highest costs will be feed, labor, depreciation, and supplies. How much potential – and realistic – savings are there for your farm? We don’t want to cut costs only to negatively impact future health and production. The best tools for comparing your farm to other Ohio farms are the benchmark reports included in the Ohio Dairy Enterprise Analysis Summaries which can be found at http://u.osu.edu/farmprofitability/ohio-farm-business-summaries/ Directions on the charts explain their use. Bottom line, you can see the range of income and expense items for other Ohio farms. Specifically these allow farms to set realistic goals for trimming expenses. We are starting 2016 with Class III milk prices dipping into the $13 per cwt range for multiple months in the futures market. (Compare to the annual averages of $15.80 for 2015 and $22.34 for 2014). We last saw $13 for several months in 2010 and January of 2011. This sure means something for Ohio dairy farms, but what? Thirty-eight Ohio dairy farms completed whole farm and enterprise analysis for 2014. This investment pays them back with tools to identify strengths and areas for improvement across their farm. We remember 2014 as the brief time when milk prices were at an all-time high…rapidly followed by 2015 with milk prices falling to 5-year lows. 2014’s returns were phenomenal. 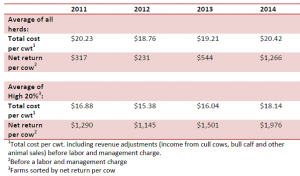 Looking at Table 1, the average net return per cow for all herds was $1,266 per cow. This was higher than the average per-cow returns for the previous 3 years added together! These returns are not just cash heading to the bank or the dealership for a new truck; they have work to do. With the net returns, the farms have to pay themselves. Hired labor is already deducted from these net returns, but the owner’s labor and management is not. They are also used to make principal payments, pay income taxes, save for retirement, and reinvest in the farm businesses. Table 1: Comparison of total cost of production per cwt. 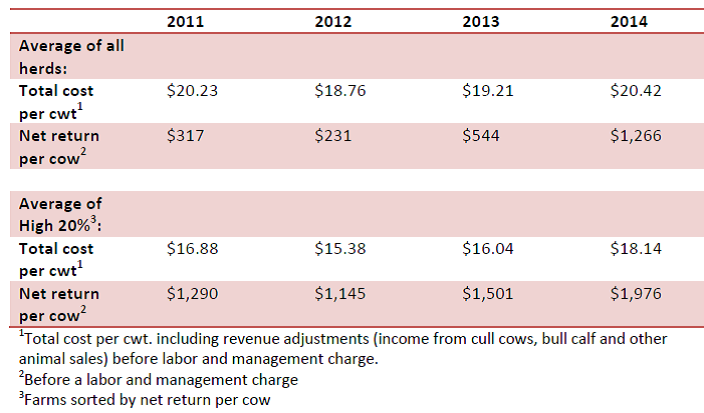 and net return per cow, 2011 – 2014 Ohio Dairy Farm Business Analysis. Raised feed valued at cost of production. The most pressing challenge we see in Table 1 comes when we look at the total cost of producing a hundred pounds (cwt.) of milk. For the past 4 years, it averaged $19.66 for these Ohio farms. This cost is already reduced by the income received for the sale of bull calves, cull cows, etc. The only non-cash cost is a depreciation charge for the use of the farm’s machinery and equipment (7% of the inventory value used for the dairy enterprise), titled vehicles (15%), and buildings and improvements (5%). On the farm, we have received an average of about 85 cents per cwt above the Class III price for our milk in Federal Order 33. The analysis farms have also received an average of $2.20 more per cwt between 2011 and 2014. These additional dollars came from combinations of higher components, quality and quantity premiums, and over-order premiums. Add all that up, and many farms are going to come up anywhere from $1 to $3 per cwt short of the cash cost of producing milk, say nothing of the unpaid labor, principal payments, etc. How to target cost savings will be the subject of my next column. To learn more, download the complete 2014 Dairy and Crop Enterprise Analysis Summaries from farmprofitability.osu.edu.